Today I am so excited to be joined by Christian McKay Heidicker, author of ATTACK OF THE 50-FOOT WALLFLOWER and CURE FOR THE COMMON UNIVERSE, with a round up of his favorite pieces of writing advice. Stay tuned after the post for a bit more about Christian and his latest book! Stressed? Overwhelmed? Worried you’ll never reach your writing goals? Shhhh. There there. You’re going to be fine. I’ve got a few things that might help. I stole them from the wisest of the wise, and they won’t mind. In Neil Gaiman’s infinitely rewatchable commencement speech (https://www.youtube.com/watch?v=plWexCID-kA&t=2s), he talks about his early days as a writer. In order to keep on track, he pictured his career goal as a distant mountain. Whenever he came to a fork in the road, he simply chose the path that would take him closer to that goal. This is brilliant. But it’s also easier said than done. We all have bills to pay, partners to please, pets and kids to attend to. Maintaining perfect focus on the mountain is a privilege most of us don’t have. But here’s a secret. Mostfamous writers didn’t have that privilege either, including your favorites. We have a tendency to mythologize writers’ early days. When Stephen King talks about his time at the Laundromat or J.K. Rowling her days in a Scottish coffee shop, we swoon. It feels so romantic! A starving author who’s got just enough grit to pull themselves out of their predicament by writing a beautiful tale that ignites heart fires and keeps the whole world spinning. But being a starving artist feels nothinglike that. It’s crushing and debilitating, and the mountain feels so far away sometimes it’s practically vanished in the haze. So let yourself off the hook a little. Hang out with your partner. Snuggle your cat. Accept the temp job that will pay the bills. Meanwhile, take baby steps toward the mountain. One day, you’ll look up and find you’ve made it halfway to your goal by barely trying. Oh, and when you’re feeling reallydisparaged, read your favorite author’s origin story and realize just how difficult the process was for them too. It will make you feel a lot better about your current situation. There’s a famous experiment where someone corralled together some kindergartners and gave them each a marshmallow: https://jamesclear.com/delayed-gratification. The experimenters told the kids that those marshmallows were theirs, and the kids could do with them whatever they wanted. However, any kid who waited a full fifteen minutesbefore eating his/her/their marshmallow would receive—wait for it—asecondmarshmallow. Jump ahead fifteen years when the experimenters caught up with their test subjects to see how they’d fared in life. They found that the kids who were able to delay marshmallowy gratification (by covering their eyes or singing a song and otherwise keeping themselves distracted) were quite a bit more successful in college. The experimenters concluded that these kids were able to get more done because they waited until after their work was completed to reward themselves. There’s some question about the accuracy of this experiment’s conclusions: https://www.theatlantic.com/family/archive/2018/06/marshmallow-test/561779/. Regardless, impulse control is a HUGE factor when trying to finish a book/get it submitted/edit the crap out of it. I’ve found that my impulse control is like a muscle. The more I work it, the easier the writing becomes. The exercise is simple: Don’t do the fun or delicious or relaxing thing until you’ve hit your word count for the day. Once the writing is finished, you can devour three bags of marshmallows, chase it with a jar of marshmallow puff spread, and snort a line of marshmallow minis. Or, y’know, watch Netflix or play video games or go on that Bumble date. And now for my final/favorite piece of advice. How do I start this . . . ? Ah, yes. Ahem. When you set out to become a writer, you will be met with crushing defeat. Whether it’s in the form of friends who forget to read your first chapter, rejections from a dozen agents, rejections from twodozen editors, bad reviews on Goodreads, or the underperformance of the second installment in your Harry Potter spinoff movie franchise, you willfail somewhere along the way. When this happens, avoid the enticement of feeling sorry for yourself. If you become a martyr for your own cause, collapsing attractively across the first chaise longue you find, pressing the back of your wrist to your forehead and lamenting, ‘Woe is me, the world is so hard, too many obstacles are in my way, and now I simply . . . can’t,’ then you’re done. No writing career for you. I believe the reason most people don’t get published is because they convince themselves that the path to writing is somehow more difficult for them. They believe they’re being unfairly treated by the same system absolutely everyone else has to go through. But here’s the truth. We all face publishing obstacles, albeit different ones. But it’s how we react to them that makes the difference. Instead of martyrizing yourself, become a trickster. Think three steps ahead. Be the fox. Be Loki. Sneer for a moment at your failures, then tackle the problem again. Better yet, try a different route. No one else is going to do it for you. There. Feel better? I hope so. 1. Imagine your career as a mountain in the distance and keep your nose pointed toward it. It’s perfectly okay to take baby steps toward your goal when other life things demand your attention. 2. Wait to treat yourself until after the work is finished. Like a muscle, your impulse control will build over time. Remember, make your daily goals reasonable. 3. Don’t be a martyr, who quits at the first sign of adversity. Rather, be a trickster, willing to find any way to hit your goal. Becoming a writer is a long slow process. Give yourself time to get there. Work a little bit every day. Love yourself. And if you’re having a hard time, email me: cmheidicker@gmail.com. I’m always looking for distractions. Christian McKay Heidicker reads and writes and drinks tea. Between his demon-hunting cat and his fiddling, redheaded girlfriend, he feels completely protected from evil spirits. Christian is the author of Scary Stories for Young Foxes, Cure for the Common Universe and Attack of the 50 Foot Wallflower. He lives in Salt Lake City, Utah. From the author of Cure for the Common Universe comes a monster-movie-like novel that bravely challenges perceived notions of beauty, identity, and modern voyeurism. Phoebe Lane is a lightning rod for monsters. 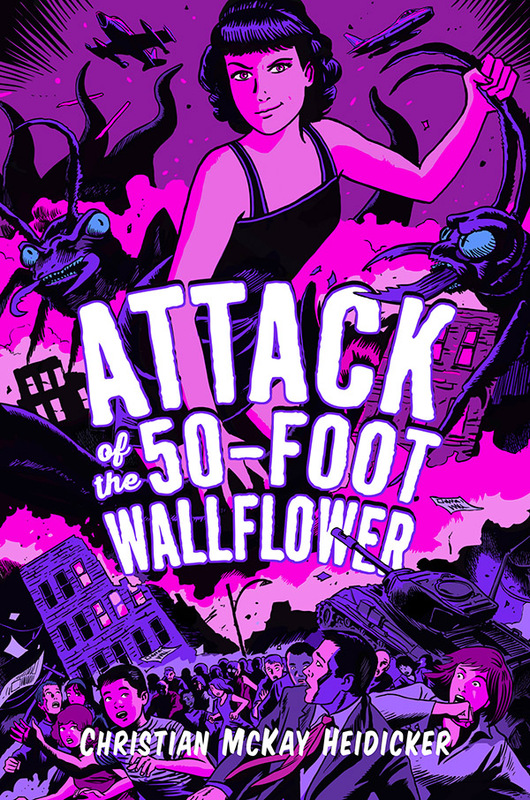 She and her mom are forced to flee flesh-eating plants, blobs from outer space, and radioactive ants. They survive thanks to Phoebe’s dad—an invisible titan, whose giant eyes warn them where the next monster attack will take place. All Phoebe wants is to stop running from motel to motel and start living a monster-free life in New York or Paris. But when her mom mysteriously vanishes, Phoebe is left to fend for herself in small-town Pennybrooke. Christian McKay Heidicker returns with a book unlike any other, challenging perceived notions of beauty, identity, and what it means to be a monster.